This photographer has spent the past two months shooting and processing and printing and posting dramatic compositions from Kauai. Some of the images rock the tonal and color spectrum. So, I was pretty proud of myself to made the adjustment to a natural environment not known for its height or drama or extremes. I found myself on Cape Cod where there were no cliffs, no waterfalls, no canyons, no crashing waves and no helicopters. I found the beauty in flat. I am happy to share with you my favorite photograph of Kauai’s polar opposite — the flat landscape of Massachusetts Bay when the tide is out. 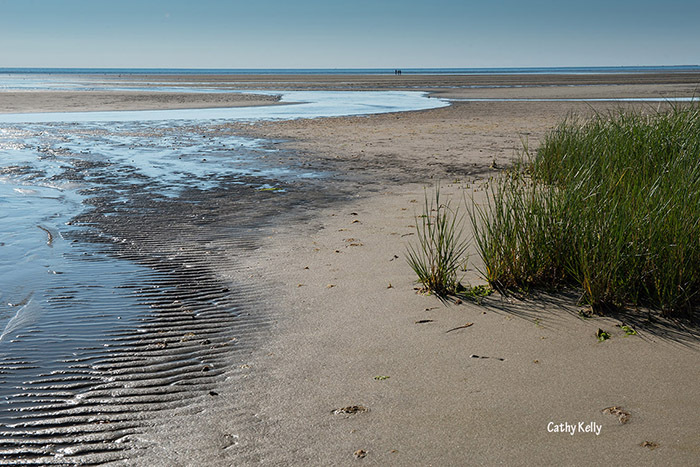 The tide — a silent and invisible yet powerful force that creates drama every day… At noon, tiny waves lap the shore and reveal the beach as a narrow strip of sand with virtually no aquatic life revealed. Nothing special about this scene except perhaps the rural development — a few cottages built atop the dune — no high-rise or crowd of people. These days “quiet” is special. Go away and return in six hours. You won’t recognize the place. Those quiet lapping waves are gone, and flat, wet sand stretches nearly as far as the eye can see. Where boats were tied to moorings, they now sit with hull on the sand. Where deep water swirled, now you see grasses three feet high. The sand is “littered” with live clams and crabs and a few jellyfish and a complex pattern of water erosion. Still, there are no people, but if you wander into the scene in any direction, you may find some footprints. The farther out you walk, the more sea gulls you encounter, some so large their footprints are as large as human footprints. Where puddles remain, the dunes and cottages are reflected. It seems you can walk forever. I think you could.